This is one of those films that as a little MonsterGirl, it left a lasting impression on me. I can remember when I’d first watched this as a child in my room late one weekend night. There was an early spring breeze blowing the curtains in and out in the precious darkness of my bedroom. I had my own little black and white television set. The cool and fragrant air puffling from outside kept wafting in. I felt sensations of chills and excitement. I hadn’t yet seen anything quite as hauntingly mysterious as the of Gothic dark beauty of Barbara Steele and the ball room scene that almost transported me into the television set, right into the ballroom itself. Feeling part of the ghostly ball. It remained in my psyche for days. For years now actually, as it was one of my first experiences with Gothic romantic horror. The sensations of longing, death and shadow overtook me. Back in the 60s when they used to run this film late at night, I vaguely remember seeing it in total, not having cut out the scene with Julia kissing Elisabeth, so the lesbian overtones that remained in the earlier version of Castle of Blood aired in its entirety. Though this is my memory of the experience and not necessarily a fact. I had purchased a copy of the film from Sinister Cinema (who really do have an impressive Catalogue) which lost some of the film’s continuity because it cuts out certain portions, perhaps because of the language inconsistency in places or the dubbing. Recently I obtained the film as it had been original released. In particular the segment where Julia tries to convince Elisabeth that they belong together, and she makes very overt sexual advances toward Elisabeth after defending her from being killed by her lover Herbert. The edited version only alludes to the fact that Julia has an attraction toward Elisabeth which could be perceived as merely jealous rivalry. 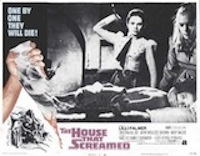 It’s the same with the newly released DVD version of Narciso Ibanez Serrador’s masterpiece, The House That Screamed 1969 with Lili Palmer, where the lesbianism was rampant at the boarding school but a lot of the scenes have been hacked to pieces. Thank god I’ve saved all my original VHS factory releases and have a version that is closest to the one I remember from the actual movie I saw in the theaters during it’s official theatrical release here in the U.S. Mary Maude is way too hot with that whip, to hack that segment apart. And Lili Palmer kissing Christina Galbo’s back after she makes Irene (Maude) whip Teresa mercilessly needs to come to it’s visual fruition in order to show Sra. Fourneau’s sexual repression. Along with Castle of Blood/Danse Macabre there were a few other films that effected me so profoundly when I was really young. With Castle of Blood, It’s more about the imagery rather than the coherent story telling. Truth be told on recent viewing I found many a plot hole and unanswered questions, yet it really doesn’t matter. Antonio Margheriti has created a lasting atmosphere of yes, the macabre. A haunting shadow place, where phantoms waltz to an otherworldly melody. 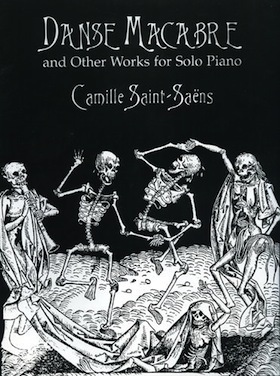 The device of using Edgar Allan Poe as an active character in the play adds an interesting element to the story yet the origin of Danse Macabre comes from French composer Camille Saint-Saëns who wrote his “tone poem” in 1874 as an art song for voice and piano and then reconfigured it for violin. 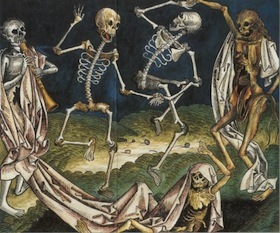 It is based on a French superstition that claims that Death comes at Midnight on every Halloween night, and calls forth the dead to rise from their graves and dance for him while he plays the fiddle. Directed by Antonio Margheriti who adopted the American name Anthony Dawson after realizing that the translation of his name was actually Anthony Daisies, thinking that it was too effeminate for his persona. The prolific Italian director, Margheriti started out in the 50s Italian film industry as a scriptwriter, but went on to direct science fiction, horror, and spaghetti westerns and cult Giallo films. Just to name a few, he directed Steele in The Long Hair of Death 1964 and Christopher Lee in Horror Castle (The Virgin of Nuremberg) 1963 Claude Rains in Battle of The Worlds 1961, Web of the Spider 1971 and the awful Cannibal Apocalypse 1980. Most of his films were directed under the pseudonym Anthony Dawson. Margheriti was the only Italian film maker that worked directly with American production companies like MGM, United Artists, 20th Century Fox and Columbia Pictures, to name a few. Director Richard Morrissey denied for years that Margheriti had anything to do with directing Andy Warhol’s Frankenstein. Morrissey claims that Margheriti mostly worked as a technical adviser on that film only actually directing a very brief segment of the film. 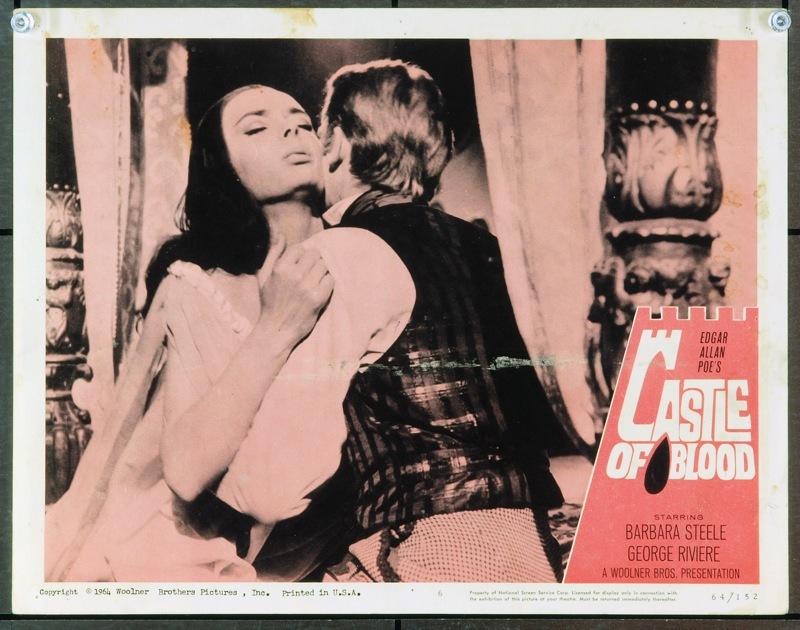 Castle of Blood stars the inimitable, the iconic doe eyed Barbara Steele as Elisabeth Blackwood. Georges Rivièreas Alan Foster, Margarete Robsahm as Julia Alert. Arturo Dominici ( Henry Kruger) as Doctor Carmus. Silvano Tranquilli ( Montgomery Gleen ) as Poe and Umberto Raho (Raul H.Newman) as Lord Thomas Blackwood and Giovanni Cianfriglia as Herbert although IMDb has him listed as Killer? He did do the killing in terms of stabbing, choking, neck breaking and blood drinking. Sylvia Sorent is the bride. 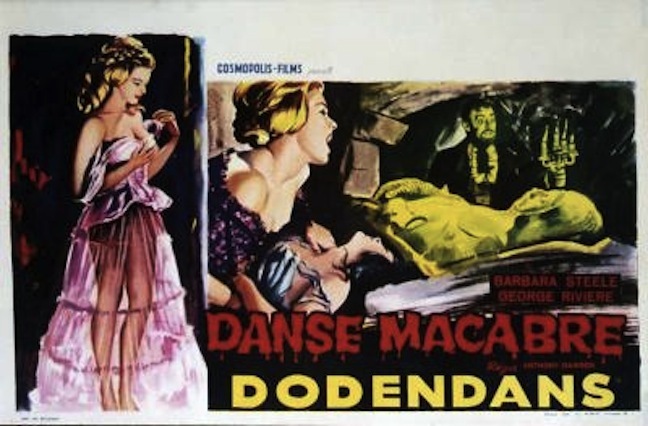 When the film’s credits roll they say Story by Jean Grimaud and Gordon Wilson Jr. From Edgar’s “Dance Macabre” screenplay by Grimaud and Wilson. Yet I am unaware of any of Poe’s short stories that this would have been based on. This is why I refer to Saint-Saëns tone poem of the same name which seems to be the preeminent and prevailing origin of this theme. Here is the closest poem I can think of that Margheriti might have been envisioning the correlation to Poe. Here’s an excerpt. In life are before thee, are again. The short synopsis goes as follows. A young English journalist Alan Foster shows up at the 4 Devils pub to try and get an interview with Edgar Allan Poe. He finds Poe telling a ghost story to another man seated at a table inside the pub. He winds up making a wager for ten pounds with Lord Thomas Blackwood that he cannot survive the infamous “night of the dead”, which is the first midnight in November. Each year Lord Blackwood does this, with unsuspecting victims who wind up falling prey to the phantoms who dwell there in his ancestral castle. Lord Blackwood’s grandfather was The Hanging Judge of London. Alan decides to take the bet, and the 3 men take Blackwood’s carriage to the castle. Once at Castle Blackwood, Alan meets the beautiful Elisabeth and both instantly form an attraction. Lord Blackwood sends people to the castle each year so Elisabeth might walk one more year. Also lurking in the castle is the mutually exquisite Julia whose portrait hangs in the great hall, and seems to come alive when ever Alan looks at it. Julia seems possessive of Elisabeth and warns her not to befriend Alan, but Elisabeth has fallen for the handsome young man who will “bring her life.” What Alan soon finds out after making love to Elisabeth only to find no heart beat, is that she is truly dead, a ghost, who has come forth on this night with the other inhabitants of the castle who must drink the blood of the one who has wagered their life away, in order that they might dance again the following November. Eventually Alan succumbs and is reunited in death with his beloved Elisabeth, who not only has a ghost husband William but a lover, the gardener and stable beefcake, Herbert. Along the way, Alan is guided down a slippery path of self destruction by scientist/doctor Carmus who warns him of how the senses live on after death. Each year the dead relive their destinies, and re enact the way they each met their deaths. In the end, Alan escapes the inner sanctum of the castle’s vampiric ghosts with the help of Elisabeth only to have the great iron gate spike impale him through the neck. I do have several questions of my own, such as, why Elisabeth Blackwood being the sister of Lord Thomas would have her grave randomly placed on the outside grounds instead of the family tomb, and if so who’s corpse was it inside the crypt, that materializes and which ghost did they become in the flesh? Elisabeth’s husband William? Or the newlyweds, which were the last people to take the wager or Carmus? None of these people, would be buried in the underground crypt as they only chose the castle as a wager or a quiet place for Carmus to do his experiments away from doubting colleagues. It certainly wouldn’t have been Herbert the gardeners’ tomb inside. So this creates a rift in the continuity and coherency for me as a contextual spectator, although the visual narrative makes up for this confusion, at least for me it does. Also If the last couple to die came back this night of Alan’s destiny, how, if they hadn’t had any blood yet did they manage to materialize? And when did this tradition “The Night of The Dead” start? Each year feasting on blood so the ghostly inhabitants can walk the earth in the flesh one more year. There would have to be an origin for the phenomena. Wouldn’t there be more people there other than Elisabeth, her husband, Julia , Herbert, Carmus and the young newlyweds. Who are those people swinging in the trees at the end?Perhaps victims of the first Lord Blackblood as he was really called when he was given the job of Hangman of London. Would these victims not walk the castle after blood as well? Was it possible that the bloody legacy of the dark Judge who hung people cursed the place? And I started to wonder why they initially all fought with each other as phantoms who seemed to have conflicting and overlapping relationships, yet in the end banded together. Were they just taunting Alan in a game of cat and mouse to set a trap for him? What really works for me with all these musings of mine, is the unique way the visual narrative unfolds, and how impressionistic the film is, enough so to have remained burned into my psyche forever. So I let these loopholes dangle, as it just doesn’t ruin the film for me. That’s why getting my one general complaint out to clear the bloggy air, is necessary for me. Towards the end, the film begins to get a bit schizophrenic in terms of being primarily a really well told ghost story, yet morphs into a story about phantoms that need to consume blood in order to reanimate each year. So the concept of vampirism evolving later on, leaves me a bit out of joint. If the spirits needed to consume another soul, as is the case of Hill House and Eleanor that would have been a bit more of a tightly woven story for my taste, but it’s still one of the most effectively atmospheric works of the 60s. Perhaps Margheriti just liked the idea of half naked beautiful dead people sucking the blood out of other half naked beautiful bodies in the blackness and cobwebbed realm of the castle. One of the things that strikes me about this particular film is the artistically visual use of monochromatic black. The blackness, the lack of any frequency of light behind the characters at times has it’s own identity in the film. It’s the purest manifestation of black I’ve seen. The characters were constantly framed in by it. It isn’t a Noir technique yet a construction of absolute lack of shadow, that make the players pop out of the darkness surrounding them. It has an effective way of forcing you to see their facial expression, almost like Gothic B&W portrait photography. In some ways, I feel that Margheriti’s use of Black is as powerful as Bava’s use of the chromatic scale of the color spectrum in his phantasmagorical horror films. A foggy London night. Alan Foster gets out of a carriage and walks toward a pub with a sign that bares the name The 4 Devils. As he walks down the stairs we hear Poe telling a ghost story to another gentleman seated at a table. After Alan introduces himself to Poe, it develops into “The Wager You Cant Stay In This House for One Night” theme. Much like Boris Karloff’s Thriller episode with Rip Torn, The Purple Room, and The episode of Rod Serling’s The Night Gallery with Leslie Nielsen called A Question of Fear. And interesting, the film starts out as a tale within a tale using Edgar Allan Poe’s story about Cousin Bernice and her scary teeth. Poe begins to impart a little lesson in the hereafter to the very skeptical and cocky writer Alan Foster who has been hounding him for an interview since he heard Poe was in London. And so ensues a round table discussion between the two thinker/writers who question what death truly means and if there exists anything beyond the “marble covering” as Poe puts it. Poe-“It was past midnight and the fire had died to embers, a light knock was heard at the door of the library. And pale as a visitor from a tomb, a servant entered walking on tip toe…he had a look filled with terror as he tried to speak to me, but he was unable. He trembled…what was he trying to say? Poe pauses. Alan Foster dressed in the cloak and hat and cane, approaches 3 men sitting at a table. The room is lit up by gaslight, yet the room is quite dark and ominously oppressive. Alan watches as if he is an unseen spectator. Now we realize the one narrating this horror tale is the great Edgar Allan Poe who continues with his ghostly tale. “On his clothes you could see smeared blood” Poe tells the story with purpose and a consuming intensity. At first he looks away, downward then he meets Lord Blackwood’s gaze and continues. “And horribly his fingers were all bloody” A small organ chord trembles low beneath the orator. Poe’s gaze still fixed intently on Blackwood, sitting across from him. “He staggered to the far side of that room and then he grabbed up the poker from the fireplace.” We now see Lord Blackwood’s face as the telling of the story continues. Blackwood has an angular face, quite satyric although appearing as a fine looking Englishman with a mustache, there is a devilish smirk to his demeanor. “Had I killed her?, I wondered” Poe stops. Takes a drink, and the then Alan the on looker interjects. 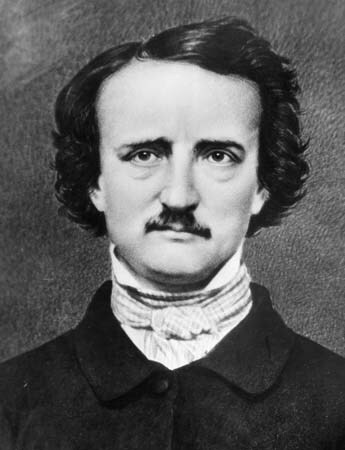 “I recently read that story of yours Mr Poe.” Poe looks up at the man for the first time, suspiciously.Alan continues to address Poe, ” It’s fiction but hearing you narrate it I’m beginning to believe it almost could be true…fascinating.” He pauses before he says the word. Fascinating as if it is a dig to Poe. Diminishing his storytelling and his work. Poe says with a little levity. Foster answers him, “You’re extraordinary…I’d been led to believe that death is certain yet you say it doesn’t exist, it does” Poe interrupts, “You’re confusing death with a tomb young man…it’s a common mistake, a sheet of marble that will cover all of us, assures us that it’s certainly a tomb but…life has not been ended. But of the people who are buried there are many who haven’t died, they’ve survived, I’ve researched this.” Foster looks at him skeptically. “Oh I think you’re making fun of me, a man of your great intelligence certainly doesn’t believe that there’s a hereafter, oh no no.” He gestures to the sky in mocking terms. “I’d like to give you more credit” Poe lilts his voice again, ” My gratitude you’ve perfectly insulted my intelligence with I’d say an exquisite elegance.” With that Poe toasts Alan and takes another sip of his wine. This public tête-à-tête between the 2 men, this duel of words starts to lighten as Alan offers his thoughts and his apology to Poe. “You don’t want me to think that they disappeared into nothing” He flutters his fingers again in disbelief. He laughs uncomfortably. “Then you will go there tonight…the night of the dead” Now the organ lays on much harder, the chord expressing danger and horror ahead. “It is only from midnight tonight , the first midnight in November…until the sunrise that you may see the dead come back again to perform those tragedies that cost them their lives.” Forster unmoved says ” Well you know this experience is liable to prove a valuable addition to my thesis I have an excellent title already…The Castle Of Terror” He laughs while Poe looks on in earnest. Then Blackwood rises and says “Of course” Poe takes one last swig of his wine and rises from the table now. The camera pulls back. The bar keep says “Thank you gentlemen…goodnight” The 3 men ascend the stairs. Poe looks rather weary then pauses at the top of the stairs to laugh at the skull of a horse hanging by the door. Now the scene has switched to the trampling sound of 2 white horses pulling the carriage through the fog. Suddenly Blackwood tells them, “Gentleman we’re here.” We hear crickets and night creatures stirring. As Poe and Foster disembark from the carriage, Poe tells him “Mr Foster you still have time if you want to return with us.” But Foster answers , “No thank you I intend to win the wager” Poe tells him to please think it over again.” Foster tells Poe, “My thanks for the interview, I fully expect to return to see if published someday. Blackwood tells him that they’ll be back at dawn to pick him up. Poe wishes him the best of luck and shakes his hand. Blackwood tells him that he’ll find the castle through that gate. He points, “And I also want to wish you good luck.” Foster says thank you and looks toward the castle still off screen. Now he approaches a massive iron gate , opening it up slowly as it creaks from the years and lack of oil. He tips his hand to the men and stands by the gate as he watches Poe and Blackwood leave in the carriage. As the carriage pulls away, strings play an eerie drawn out one bowed note, he closes the creaking gate, staring through the fog, as it swells around him like ectoplasm. A low note keeps pulsing. He stands in the darkness. Now walking with a slow stride toward the castle. He looks around the grounds. There are grave markers and a large stone wall surround him. We see a close up of a cat’s eyes. Beautiful little black cat, a nod to Poe perhaps. He begs the branches away from his face. Walking deeper into the castle’s domain,we now see the little black cat in total, as Foster smiles he suddenly becomes oddly tangled in dangling branches, while a horn blares like little stab wounds to his head and shoulders. He gets himself clear of the branches, still walking passed grave stone after grave stone. His black cloak sweeps in the fog. Now he starts to ascend some stone steps. Strikes a match and lights a small candle. He comes upon a rotting wooden door which is the entrance to a stables. Now we see the little black cat briefly playing with a silken lacy scarf, and a music box theme begins to play. Foster picks up the shiny fabric with his cane and looks at it by the candle light. Now in the main grand dining room of the house, he tosses the scarf onto the table and walks around the room. He drops his candle and is suddenly thrust into more darkness and shadow. The organ escalates to octaves of blaring wiry waves, Forster walks thru the darkness. Now holding a candelabra. The candles seem to burn out inexplicably. A theremin wavering and warbling indicates a spooky macabre presence, something of the supernatural realm. Foster goes to the window. The soundtrack oscillates like a droning whistle as he lights the candles again. We hear the running scales, a typical haunted house gimmick or spook sound effect. Yet somehow along with the cinematography it does not appear ridiculous or absurd as in farce. He takes his hat and cloak off, picks up the candles again walks around until the clock strikes out, as he walks over to view it through the hall. It is 11:30 pm close to midnight. The mechanisms of the clock are still yet the clock chimed. We hear the sound of his heels clicking on the stone floor. The clock strikes again as he walks away and then stops again. He looks at his own pocket watch. Now the clock has started ticking once again as if playing tricks on him. He is suddenly startled. Its the reflection of his own image in a dust covered mirror. He begins to lecture himself earnestly. He enters another room and closes the heavy wooden door. Now there is an image of a beautiful blond woman with her hair done up, she is an elegant lady. The screen shot of the painting start to warble, he looks at the painting mystified. The music becomes all spooky and wavy again, “It’s just a painting” as it ripples before his eyes as if in the midst of severe heat. He talks to it. “You’re a beauty…I’ve decided to make notes, will you mind?” he says as he looks up at the portrait. He makes a “Hhm” gesture to the lady and begins to write in his notebook, sitting at the table. Now a mysterious waltz is heard, as if from a distant ball room. A lovely melody. Celebratory and charming. Romantic. Lyrical and fable like and hauntingly elegant. As the music played on an aged harpsichord reverberates through the castle, Foster goes to investigate the uncanny music. As he walks closer toward it, he sees the briefest impression of a woman in a white dress run through a door and close it. As he goes to the closed door, the music abruptly stops. Now as he opens the creaking door, a bat flies passed him forcing him duck. He walks slowly around the quiet, dark empty room. He lights a match and gets some candles lit again. Now sitting at the harpsichord he reads the sheet music and plays the very melody he just heard coming from that room. Suddenly a woman’s hand reaches out and touches his shoulder from behind. He turns around and there standing before him is the bewitching doe eyed Barbara Steele. “Did my brother send you?” He rises, smiles and responds, ” If you’re referring to Sir Lord Thomas Blackwood, yes.” He clasps his hands together a little shy and taken with her presence. “I’m Alan, Alan Foster” She meets his introduction, “my name is Elisabeth.” “Your brother led me to believe the castle was uninhabited” She answers him looking up, just a little coy ” I see.”She continues. Foster asks her, “Is it fantasy or real?” She tells him, ” like all fantastic stories, mere coincidence and a little reality.” She smiles and looks downward. Now looking up at him, “But…don’t you want to win the wager?” He hesitates a little, then asks, “is there anyone who has succeeded in the past?” Her eyebrows arch, her eyes open wide, “the past doesn’t count, you’re here tonight…you’ll win and get rich.” Now there is a long stare as she penetrates the silence and gazes into his eyes. Foster tells her. “Come this way, must I have to give you courage…a woman…that doesn’t seem right now does it?” She leads him through the great room with the long wooden dining table. Wearing her flowing white gown she looks like an apparition. A materialization with a lovely yet, sardonic demeanor. She turns to face him on the stairs, looking down at him, “I’m glad you feel that way, I hope you feel at home because you’re nice.” As he starts to climb towards her she tells him, “yes I like you very much…and Julia will like you.” Now she turns around a little, anger in her tone. “But she must realize that my brother sent you to visit me.” A beautiful little melody plays as he follows her upstairs along the cobwebbed corridor. Swiflty she looks somber and distant, as if thinking of things past. Her beautiful profile surrounded by the lacy canopy cover of the 4 poster bed.”You haven’t missed anything while you’ve stayed here in your own world you seem content.” Now she looks away from him and downward. She’s more shrouded in shadow, she flicks her hair off her shoulders away from, her face and lilts her head upward a bit, eyes closed. He continues, “Are you not?” he asks and then adds. Elisabeth looks frightened. Alan bows and greets her, “earlier tonight I was admiring your beautiful portrait.” Glancing over at Elisabeth. Julia says contentiously, “Yet Elisabeth is the woman you admire” Alan responds, “Ah, Elizabeth really is beautiful isn’t she…but you are also beautiful my dear Julia”Julia replies, ” Well you are kind” her icy face warms up a little. She is stunning yet she is austere and otherworldly. “Oh don’t threaten me as you can see, Mr Foster is finding this very embarrassing Elisabeth” Foster starts to look outward in between the 2 women who are fighting over his presence there. “I have the feeling that he might like to be left alone, why don’t you leave” Elisabeth snaps at Julia “be still!” Julia tells her, “you’re being childish again” Elisabeth says, “well I’ll leave then” and starts to exit the room. Just before she leaves the room, she pauses with her back turned to Alan and Julia, holds onto the door, it lets out a creak then she’s gone. Julia is wearing an off the shoulder black gown, where as Elisabeth is wearing a flowing white gown. Is this setting up the symbolism of the heroine and the femme fatale once again to delineate who is the heroine and who is the antagonist. There is a slight pause, she bids him goodnight, he bows, she closes the door. Briefly Alan stands in the room reflecting on everything, and the scene quickly switches to Elisabeth leaning against a wall, looking solemn, Julia approaches her. “I’m certain that with Alan here I could really be happy…you’re speaking like this Julia only because you’re so jealous…that’s the only reason you’re so against us” Julia touches Elisabeth’s face and answers, “No, you’re liable to feel disappointed.” Elisabeth slaps her hand away, “I’ll not be…I’ve dreamed of this night. At last I can go away with the man I love” Julia again coldly, frozen as ice says , “You can’t leave Elisabeth, you’re trapped in this castle” She answers, ” trapped here, no it’s not true.” She turns away…it can’t be, it can’t be” she runs away crying and screaming the words. Now Alan is taking off his coat. He goes to the desk and rifles through several dusty books looking at the titles. He starts to leaf through one. Inside the book is a note that reads “I’ll expect you at midnight.”The inside title page says Carmus Elements of Metaphysics Medicine. He takes it to his bed, lyes down and begins to read, when the door handle to his room begins to jiggle. The music turns troubling and Alan goes to grab his little pistol while he waits to see who will be opening up the door to his room. The strings start striking fear and panic, developing the tension. “Oh Alan, I’m so very happy you said that…kiss me…be mine then.” She whispers it again, “kiss me…love me Alan…love me” He embraces her, she grabs him around the neck and cheek to cheek she says in his ear, “oh yes my dearest.” Her hands grip the back of his head, she looks in exquisite pain as he buries his face in her neck, lavishing her with kisses. Their theme plays gently. The camera switches to Julia lurking outside the door. She collapses against the wall. “I tried telling her” The lighting is set only upon her face and shoulders. Casting her in an a strange light. We here Elisabeth speaking and moaning in the midst of their passionate love making while Julia listens tortured by the sound of Elisabeth in the throws of passion with this other man. Julia tells the man, “She’ll be sorry that she did, pretending to be something that she isn’t…I better tell Herbert, excuse me.” She tries to go passed him, turns around and looks a little frightened of the man, then keeps going. Alan now rests his head on her breast. Still she hasn’t moved. Staring like a corpse. Pale and unemotional, while he clings to her so sweetly. As he holds himself close to her he grabs her hand. Suddenly he becomes startled, aroused by something that frightens him. He cries out,”Elisabeth!” She quite still very still answers his pleas, “Yes Alan” knowing that he has discovered the secret. He collapses back onto of her and says, “Oh thank heavens…for a moment I thought…that your heart had stopped.” Now the frame shows a close up of Elisabeth still unmoved by his feared revelation then his relapsing back into a fetal lovers embrace. Elisabeth’s face like marble so endlessly still and unmoved, and still so eerily quiet. She begins to talk in linear tone. There is a sudden shock cut as a brutish muscular man with no shirt comes bursting into the room calling “Elisabeth!” She finally moves. Sitting up and screaming, “No! No Herbert No!” as the muscle bulging brute comes bounding toward the lovers on the bed. She screams “NO NO”, as he stabs her in the stomach. Alan punches him in the face which knocks him back. The man rushes out of the room stumbling away, the strings are furious, Alan goes off in pursuit. Alan holds out his pistol and shoots the man who falls to the ground. Presumably dead. As Alan gets closer to the body, it just evaporates into thin air. Dissolves as if never having been there. Finally Alan asks, ” You sir, who are you?” He answers, “I am Dr Carmus”Alan seeming surprised “Carmus?…the famous Dr and scientist?” Carmus approaches the startled Alan. “You heard everything?” Carmus answers, “yes I heard every word…and I also saw what happened, but I was unable to intervene in any way…you will understand the reason.” He brings Alan his drink who is now putting his jacket back on. “Sit down please, sit down and let the drink relax you” Alan sits and swigs down the glass of whiskey. Perhaps this is a clue into the history and the origin of the dead coming back to life by way of the senses and the need for blood. Maybe it was Carmus who first experimented with the few dead souls living in the house, reanimating them. No, because he meets his fate at the hands of Herbert who comes into his study and snaps his neck. Never mind! “They are there also…victims of their destiny.” Alan responds, “What destiny?” Carmus tells him “Come with me I shall explain.” He grabs a lit candelabra and begins to have Alan follow him. “In a few minutes more, the dead will relive their last few 5 minutes in which they encounter their destiny” The haunting waltz begins to appear faintly in the background, then suddenly turns sinister. They walk thru large wooden doors. Fade to Black then cross Fade in, they enter a very dark room the candles burning. “Please Dr, I beg of you, tell me of Elisabeth.” All of a sudden the clock begins to strike. Carmus says, “It is the hour…words have no meaning…look in there.” As the clock continues to strike. A dream like whirring begins as part of the soundtrack effect. We are looking into an empty ballroom at first. The camera begins to move closer on Alan’s face, the light in the room darkens in and out, We see light reflected onto Alan’s face and from his perspective we understand that something is changing in the room. It cross fades into a well lit ballroom filled with well dressed society types twirling around the room to the now infamous motif waltz of the film. Elisabeth is dancing with the man who had approached Julia outside the bedroom. This is William, Elisabeth’s husband who has just returned from America. He asks Elisabeth if she’d like some water as she sits to rest, she tells him yes. Now seated by the window watching the other guests dance, a dark brooding figure moves outside the window pane. It is the muscular man who had plunged a knife into Elisabeth’s stomach earlier, who knocks on the window. Elisabeth goes to him. ” What do you want?” Herbert insists, “I must talk to you please don’t say no.” Julia watching this exchange begins to move toward the 2 talking at the window. Once Elisabeth sees Julia coming she tells Herbert, “I’ll try to reach you later… go away!” She closes the window on him. There is a very long pause while the 2 women just stare at each other. Julia with a knowing glance, Elisabeth, with more of a pensive look on her face. We hear husband William call ” Elisabeth, here sips this.” He hands her her drink. Elisabeth grabs a candelabra and tells William that she wants to show them out. As she leaves thru the front door of the castle, we see Julia leaning against a wall looking upset. Elisabeth tells Cynthia Blackwood goodnight and then bids Lord Blacky the same. They get into their carriage and pull away. Instantly Herbert comes out of the shadows and knocks the candles out of her hands, as he grabs her and tells her, “I must talk to you, I told you that!” She gasps. “Not now,. my husband will be looking for us” He grabs her behind a wall and watches as other people come out of the castle. They hide in the shadows. He pulls her into the carriage house that we first saw in the beginning of the film, where Alan stumbles upon the lace scarf. “He’s my husband did you forget that?…let go of me.”Herbert is agitated, ” I’m warning you before it’s too late.” He begins to kiss her neck. She says No, yet as he sinks down her body, we see her face start to express ecstasy. Now the scene fades into a blur then framed again is Alan’s expression as he is witnessing the past events unfold. They walk thru the room, and near the wooden door that Alan had tried to open earlier but wouldn’t budge. Carmus easily pushes it open to reveal the bed. where William and Elizabeth are making love. Then walks in Herbert. Alan is watching this whole thing happen from the sidelines with Carmus. Alan watches horrified as Herbert grabs William with his arm around his neck choking the life out of him. Elisabeth is now sitting up in the bed clutching her hands to her mouth. Now as he starts to strangle Elizabeth, someone comes out from behind the canopy lacing to the bed and strikes him with a large brass candelabra. Alan looks quickly at Carmus who looks back at Alan with an all knowing look. It is Julia who from behind the great wooden bed posts, comes out of the shadows and has strikes Herbert down. Liz falls back onto the pillow. She cries no! Julia nudges Herbert’s head to the side with her pointed shoe so casually to see if he’s dead. He is lifeless, his head smeared in blood. Elisabeth, is crying and rolls over to sob more. Julia looks over at her, comes and sits beside Elisabeth tenderly and puts her hand on her shoulder. “Don’t cry” She rests her cheek on Elisabeth’s naked shoulder. “You’re safe now … he won’t harm you again. I’ve killed him it’s alright. I knew this was going to happen.” Now Alan is still watching the scene unfold from the corner of the room, the 2 women unaware of his presence. “I knew he would try to hurt you, but that’s all over now ” Elisabeth is still sobbing. Julia climbs on top of her, but Elisabeth starts refusing her advances. She turns to the side table and pulls out a knife that is inside a book. Julia is stroking Elisabeth’s hair and kissing her face, and telling her that she loves her and they belong together. Then Elisabeth plunges the knife into Julia who screams out in pain. She pushes Julia’s lifeless body off of her and gets out of the bed and walks by the body of her dead lover, Herbert. She turns away and cries and screams into her hands. Now the voice of Carmus seems remote. “There is more for you to see Foster…watch closely, the dead are living on this night.” Alan is crying, “I don’t want to see!” He is veiled in shadow now. He shakes himself loose of it and then points insistently, “I want no more of your tricks!….Carmus!!! !” he shouts. Suddenly we see close up of Alan shock upon his face. He gasps. He has turned around in the same room that is now empty and pristine again. He walks over and around the bed. Looks to the side panel where Julia had emerged not more than minutes earlier. A single string note is drawing out. He calls out, ” Carmus!” into the hallway. “Elisabeth!” It is dark and seems long and far off. Walking back into the room slightly, then jumping back startled, calling “Carmus” he is visibly shaken and his previous cockiness altered. “I’m sorry that I made the bet, I must get out…CARMUS!!!!!! !” he shouts for his life now. “You win the wager, I admit I’ve lost” He is startled we see the door creaking open slowly. Walking through the door a Theremin plays, Alan looks all around the empty room. Filled with books, a skull lit candles, but no sign of Carmus. Alan turns suddenly, we see Carmus enter wearing a black hat and holding a lit candelabra, Alan calls to him but he seems not to be aware of his presence. We are now seeing Carmus’s destiny reenacted. There is a distorted rumble as we get a close up of Alan’s eyes. The revelation has sunk in. Carmus sets down the candles takes off his hat, takes a flask of out of the cabinet and pours a drink . Again close up on Alan’s eyes. Carmus takes his cloak off, sits back in his chair holding the glass. With a deep sigh he drinks from the glass, and then suddenly we hear a door creaking. Carmus looks over toward the sound, setting the drink down he rises up from the desk and goes to investigate. Alan calls after him. Carmus walks about the castle with the lit candles as we hear a constant creaking back and forth like a rusty gate swinging. Now we see that it is a door opening and closing itself. Carmus grabs it and begins to walk down a darkened stairs. A stone pillar obstructs our view. We’ve not seen this part of the castle before. Slowly he descends into the cavernous space below. In the darkness with only his candles lit. He enters through another creaky wooden door and the Theremin warbles again. It is the underground tombs, the ancestral crypt. Stone lions and knights cover the resting places. Cob webs and darkness. Carmus sets the candles down on one tomb, and begins to uncover the heavy stone lid. As the lid crashes to the ground it exposes a mummified corpse that begins to breath with life. We hear it inhaling and exhaling with staggered breath. It’s chest rising and falling and the low indistinct groaning and gasping for air. Carmus starts to back away. A mist forms over the corpse veiling it in a white vapor. Carmus looks on. As he heads toward the doorway, the vapor leaks out slowly down from the tomb as if in pursuit. Frightened he gradually climbs the steps again. His footsteps making echoes on the floor. Looking backward , the clock strikes midnight. His pace becomes hurried as he goes back into his study. Out of breath. He closes the door and locks it. Again we see Alan witnessing this. Carmus takes a quill pen and begins to write something. Alan turns around as now Herbert has entered the room. He calls out to Carmus. “Carmus look out!” Herbert is approaching , but Carmus does not hear Alan’s warning. The blood stain is still apparent on Herberts head. Alan watches as Hebert first breaks Carmus’ neck then begins to drink his blood. Alan puts his face in his hands. Now Carmus walks into the room, ” it’s over now Foster you have seen how I met my destiny” The camera pans back over to the desk. Carmus is no longer there. Panning back toward Alan, Carmus is no longer in the room at all. The nightmare fully realized. Il Sangui i fonte di vita Solo il sangue la rivivere i morti! i moi berremo alla tua fonte!! The Blood, the source of Single life, the blood revives the dead men! they will drink your life source! Alan walks over to the desk and reads what Carmus had written right before his death. Then we hear a remote laughter. Alan looks around the room, the camera closes in on the skull on the desk. Alan has pulled out his pistol, then throws it onto the desk , dismissing it, knowing that it would be useless at this point he tosses it onto the desk. He looks down on the desk, once more and then walks out of the study. At first the castle seems empty and then we see Julia’s painting so life like. As Alan continues to walk, we hear casual laughter. We see a young couple enter the castle through the front door, the woman Elsie in a bonnet tells her husband, ” It’s marvelous just perfect for our wedding night”He answers, “A night of love and terror according to what Sir Thomas told us earlier” Elsie is a pretty blond and her new husband a young gentleman in a top hat, cloak and cane. They enter the castle. “Don’t leave me alone, “She tells him. Alan is watching this from the side. “Why, are you really afraid? “She laughs, “yes but not of you” they kiss. Alan says to himself out loud. “They’ll be killed…don’t…come back…I warned you!” We hear the theme, the waltz melody starts to drift. The groom lights a candle. They walk up the stairs, Alan calls after them, “You’re going to your death go back!” He looks down defeated. The music stops abruptly. Does he now realize that this is more of the dead living out their destinies this fateful night. Quick cut to the young bride smiling at her husband. The room lit up almost like the ballroom again but in the bedroom. “Did you hear that?” Elsie’s husband says “are you telling me you’re afraid of a few ghosts?” He grabs her and kisses her. She pushes him away. ” I heard a sound I’m sure I did” He looks pleasantly frustrated. ” I better check… better not run away.” He teases. She laughs takes off an outer layer of clothes exposing an ample bossom in courset. We hear the melody again, Alan is walking around again this time with a more defiant look on his face. He looks upward as if to confront the unseen phantoms that have been assailing him. Both the groom and Alan’s wandering are juxtaposed as both are looking for phantoms. The groom is in Carmus’s study with his candles. The bride Elsie is taking off her clothes, by the fire. We hear the melody again. Now Alan is turning , then the groom, then the wife brushing her hair in the mirror. As she looks down, we see Herbert’s reflection coming toward her. She screams, he grabs her. Jump cut, switch to the groom hearing the scream. He calls and then runs, ” Elsie!” He enters the room, looking horrified. Alan also begins to ascend the staircase quickly. The groom runs over to Herbert who is hovering over his new bride Elsie. Herbert has been drinking her blood, as he looks up the blood soaked on his face, a devouring look of hunger. He chokes the life out of the man who falls beside his wife’s lifeless body. Alan rushes into the room. The scene is framed beautifully as we see Alan boxed in by the couple holding hands, on either side of him. He runs down the stairs. They follow slowly. Now Carmus emerges from a doorway. 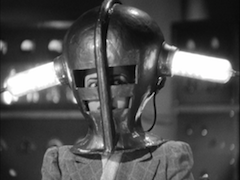 The chordal whirring is building toward the film’s climax. He turns around and calls out “Elisabeth.” Herbert is now in view, about to come after Alan. Carmus is following too. Someone is laying on the organ peddle, whirring the chordal pads, as the phantoms slowly descend upon Alan. Leaning up against a coat of arms, the door suddenly swings open. Elisabeth reaches out to him. “This way Alan follow me” He is down by the tombs, on the stairs. Elisabeth vanishes again. He calls to her. He enters the room and locks the door as if that would really help, locking out mists and the walking spirits of the damned, dead. Hes sweating and breathing fast. Before he can strike a match to light the torch it erupts into flames for him. He walks over to the tombs. Holding the torch, he looks at his watch it’s 5am “Soon now there’ll be light” The torch hovers over an empty tomb. Then a mist starts to come from underneath the door. His eyes widen , the Theremin plays. The white vapor continues to seep under the door. Like a waterfall of fog. These spirits are all closing in on him. Carmus tells him, “Blood that is the fountain” Alan leans against the stone wall which is a trapped door, and when he leans, he triggers it and winds up on the other side of the wall now. ” You can!” She insists, “No”but Alan keeps pulling her along, “Elisabeth, I can feel the life in your body…you must come with me.” She implores him, ” I can’t…I can’t go with you.” He continues to pull her along with him as he runs toward release. ” I beg you let go of me…please, I’m dead Alan…I can’t leave here…Alan it’s impossible that our worlds could ever be together.” They are now outside on the darkened grounds of the castle. She falls to the ground, ” No Alan I’m dead….she looks up at him looking drained, her face turning oddly darker, circles from around her eyes…she says, “Goodbye Alan.” very weak and fading. The look of shock overcomes his face, as she dissolves, at first mist like then a skeleton, then the dirt below until there is nothing left of Elisabeth. The frost is streaming from his heavy breath as he looks over at a cross. The frame pans down we see the name carved in stone. Elisabeth Blackwood is engraved on the headstone. She has fallen onto her own grave. Now he stumbles in the foggy early morning. We hear the voices again, “Your blood will be ours.” ” You cannot escape us.” ” It is your destiny.” The scene begins a dizzying swirl as we look up at the boney branches of the low hanging trees like arms and fingers reaching out to grab Alan. “Your blood will be ours!” His face frozen in grimace of fear framed in by the branches, as he tries to flee the voices. He is twirling and stumbling through the boney branches of trees the voices still pursuing him. “You cannot escape.” The phantoms continue their same diatribe of death, as Alan looks up at the bodies dangling from the trees. He clasps his hands over his ears. The entire scene is so beautifully eerie and yes, macabre. The music has disassembled into cymbals and warbles an effective nightmarish discord of tremors. as Alan reaches the imposing iron gate to the castle. He begins to open it. He steps outside of it, pausing to catch his breath. Suddenly the gate closes in upon him driving one of the iron spikes thru the back of his neck. He cries out in agony. Grabbing his head, as the death rales leave his body, he hangs there lifeless, impaled by the gate spike. He has not escaped at all. Cross fade to day light and a shot of the brightened sky and the trees. The naturalistic sounds of birds singing, and the misleading sounds of surrounding life as the carriage pulls up to the gate. Blackwood who has a strange look on his face, tells the coach driver to stop by the gate. It’s a look of a worried man. Poe then turns to Blackwood with a stone cold expression, realizing that Alan is hanging there absolutely lifeless. Blackwood is now looking down. Perhaps a tinge of guilt, but also possible relief that his wager fed his sister another life force as he had intended from the beginning. The 2 men get into the carriage and pull away. We see Alan’s body in broad day light, hanging from the iron gate. It is a chilling moment. The camera lowers passed Alan’s body down to the leaves on the ground and we hear Elisabeth’s voice remote from somewhere in the daylight shadow, “You have stayed with me Alan.” Then Alan’s voice answers her. “Yes Elisabeth.” A beautifully romantic melody plays as the camera rises to the sunlit sky poking through the tree tops. The night of the dead is over and the lovers remain together. United at last, in death. The camera pauses on the burning hazy light of the sky. The theme of the waltz has now morphed into a triumverant melody rejoicing in the culmination of their union. Abruptly the music turns ominous again, as we know the next year will bring yet another wager, yet another victim. FINE comes onto the screen. The nightmare continues. Posted on May 13, 2011 March 16, 2015 by monstergirlPosted in 1960s, Barbara Steele, Castle of Blood / Danse Macabre (1964), Classic Horror, Directors and Filmmakers, Edgar Allan Poe, Fantasy, femme fatale, foreign horror, Gothic Horror, hauntings and things that go bump, Literature The Novel and The Screenplay, mad scientist, psychological thriller, Top Classic Horror Films, Ubiquity, wild women, women as objects, Women in PerilTagged Anthony Dawson, Antonio Margheriti, Barbara Steele, Camille Saint Saens Danse Macabre, Castle of Blood, Danse Macabra, Edgar Allan Poe, Foreign Italian horror films, Georges Riviereas, Ghosts and haunted castles, Riz Ortolani, Vampire Gothic Tales. Jo Gabriel Fools and Orphans. This was a great job you did here! You basically created a photo-novel version of this amazing film. Screen captures are awesome huh? :-) Loved it! 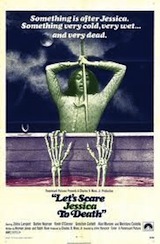 I also share your enthusiasm & love for this great 60’s horror flick. I remember when I first watched this movie as a child (9 yrs. old). I had spent the weekend at my grandma’s and stayed up late on Saturday night watching Shock Theater with my horror flick loving aunt. My mom would never have allowed me to watch it. My aunt was really cool though. (Her being 17 years old had something to do with it I’m sure :-)…She was the one who introduced me to the horror genre at a young age and I watched many great horror films with her. I haven’t watched the uncut version yet, and have put it on my “to get” movie list. The one I saw as a child had an alternate title – “The Castle Of Terror”. I was totally mesmerized by the film from start to finish. 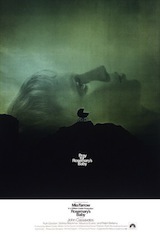 It is, in my opinion, one of the best & creepiest horror films of all time! Oh, and the musical sountrack by Ritz Ortolani is amazing! The organ and theremin were so perfectly used throughout the film and especially in particular scenes. Beautifully eerie! And I will never forget that awesome waltz, especially the string version of it during the flashback in the ballroom scene! Really beautiful with a haunting quality to it! I share the enthusiasm here for the job you did on uploads and narrative. 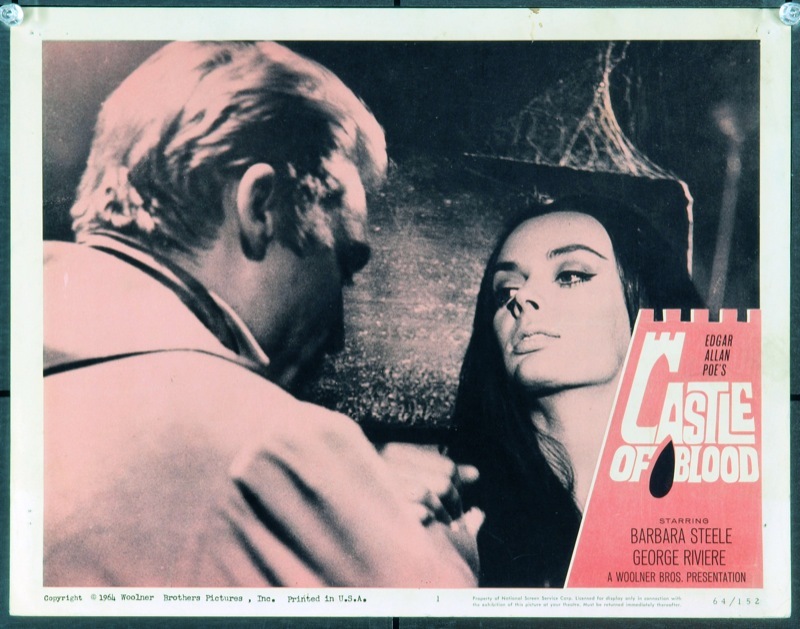 I, too, saw CASTLE OF BLOOD (the title has a few variants) on tv when I was ultra-young. 7 or 8. Its forbidding, claustrophobic environment and downbeat ending drove thru me like the spike in Foster’s neck! For me, at that age, it seemed like a real experience. (Believing in ghosts at the time added a lot to the effect) It has always been easy for me to disregard the director’s flaws (the fact, for instance, that Foster never tries to break a window to get out) because strictly as a story it is the QUINTESSENTIAL haunted castle yarn. It’s really not easy to do a ghost flick that’s creepy in a way that sticks with you, and I think one key reason this thing stands out is because the protagonist’s life gets directly woven into the ghosts’ unearthly existence. His own existence in our world had been a meager and unhappy one, he reveals to Elisabeth. And by dawn…he is ONE of them! Yet, in a final plot twist, he finds the happiness in this limbo existence with Elisabeth that he could never find in OUR world. Very haunting vibes to the whole narrative! This movie was one of my inspirations for becoming an artist. I’m glad these vintage Spaghetti horror flicks are being appreciated.The other Barbara Steele ghost flick I like just about as much is NIGHTMARE CASTLE. (scored by Morricone) Awesome job!